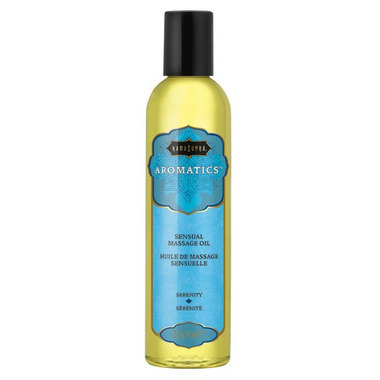 Kama Sutra Aromatics Sensual Massage Oil is made with essential oils to promote deep relaxation. This rich, emollient formula makes it a pleasure to give or receive a sensuous, full-body massage. Pour Kama Sutra's massage oils into the bath or smooth onto the body as a daily moisturizer for silky, hydrated skin. This massage oil has essences of marjoram, geranium and lavender- a calming blend created to ease stress and release tension. Ingredients: Glycine Soja (Soybean) Oil, Vitis Vinifera (Grape) Seed Oil, Pistacia Vera Seed Oil, C 12-15 Alkyl Benzoate,caprylic/capric Triglyceride, Prunus Amygdalus Dulcis (Sweet Almond) Oil, Fragrance (Parfum), Tocopheryl Acetate, Lecithin, Benzyl Alcohol, Benzyl Benzoate, Benzyl Salicylate, Eugenol, Farnesol, Geraniol, Isoeugenol, Limonene, Linalool.